Lyon institution Macadam Mambo continue to carve their own path through the audio ocean, proudly pushing a penchant for those odd sounds found in the musical fringes. Metal dance, unhinged acid, sci-fi synth or NDW grunge, you name it, they've done it. Now they introduce the new Ambient / Krautrock / Weirdo / Crétin project by one half of hometown heroes The Pilotwings, Louis E Bola. Teaming up with with musicians Geddes Hadden, Arthur Tempo, Akino Karma, Sound Of Duty Free & Pierre Mortimer-Dubation, E Bola treats us to an infectious blend of Christian Morin's "Aquarella" and Conrad Schnitzler, strolling from gentle moments of mallet-fuelled calm through vocoded drone paranoia to arrive at the waveform euphoria of digital epiphany. 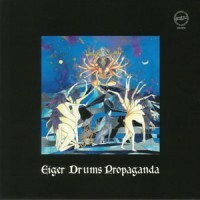 Patrick says: Killer French kosmische with a hint of the new age from new group Eiger Drums Propaganda. Boasting one half of the Pilotwings alongside a crack team of musical madheads, this 5D trip is another essential from the Macadam Mambo crew.